The controller of BBC1, Mr Michael Grade, may well be longing by this morning to step into the Tardis and whisk himself beyond the range of the outcry stirred up by his decision yesterday to postpone the next series of Dr Who. Work on the new series, originally scheduled for January next year and starring Colin Baker and Nicola Bryant, was due to start in a month's time. 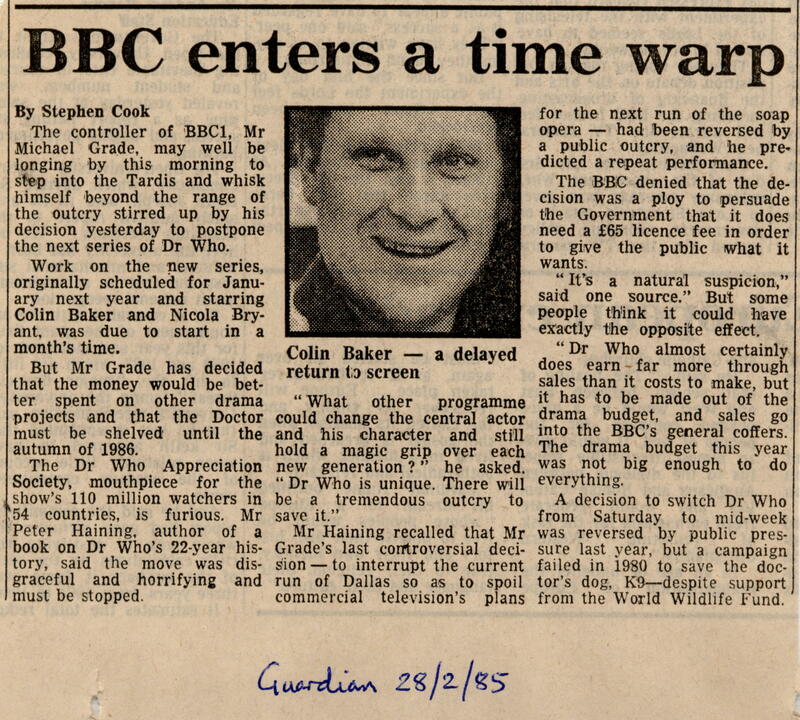 But Mr Grade has decided that the money would be better spent on other drama projects and that the Doctor must be shelved until the autumn of 1986. The Dr Who Appreciation Society, mouthpiece for the show's 110 million watchers in 54 countries, is furious. Mr Peter Haining, author of a book on Dr Who's 22-year history, said the move was disgraceful and horrifying and must be stopped. "What other programme could change the central actor and his character and still hold a magic grip over each new generation?" he asked. "Dr Who is unique. There will be a tremendous outcry to save it." Mr Haining recalled that Mr Grade's last controversial decision — to interrupt the current run of Dallas so as to spoil commercial television's plans for the next run of the soap opera — had been reversed by a public outcry, and he predicted a repeat performance. The BBC denied that the decision was a ploy to persuade the Government that it does need a £65 licence fee in order to give the public what it wants. "It's a natural suspicion," said one source." But some people think it could have exactly the opposite effect. "Dr Who almost certainly does earn - far more through sales than it costs to make, but it has to be made out of the drama budget, and sales go into the BBC's general coffers. The drama budget this year was not big enough to do everything. A decision to switch Dr Who from Saturday to mid-week was reversed by public pressure last year, but a campaign failed in 1980 to save the doctor's dog, KS—despite support from the World Wildlife Fund. APA 6th ed. : Cook, Stephen (1985-02-28). BBC enters a time warp. The Guardian . MLA 7th ed. : Cook, Stephen. "BBC enters a time warp." The Guardian [add city] 1985-02-28. Print. Turabian: Cook, Stephen. "BBC enters a time warp." The Guardian, 1985-02-28, section, edition. This page was last modified on 25 March 2018, at 18:44.